Terribly sorry for procrastinating so horribly, everyone! I've added all the new entries possible! CooliøAJ wrote: Could you add mine? I'll try to add Bumble Snakes as soon as I can! So, I don't know if anyone has actually realised it but having the name and image of a store's currency is kinda... not very useful. I had my reasons for including it in the beginning, but I feel it is time to change it to something more relevant. From now on, instead of the specific currency, each stores will have their currency type listed. This means I'll list whether they have their own currency, no currency or use CS pets/items/C$ instead. From now on, if you want your thread added, please include currency type instead. Adoptable category (dogs, wolves, hybrids etc): Hybrid! Is your store active? : Yep! 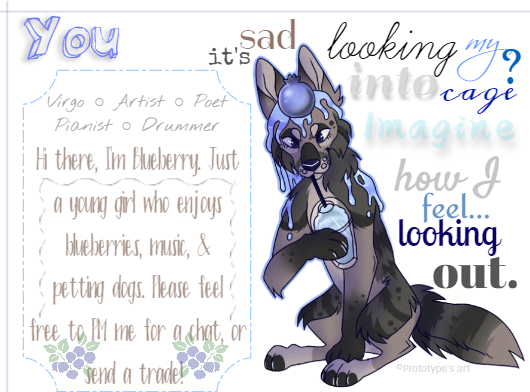 Example image (preferably an adoptable): A current raffle! Last edited by LittleTrain on Tue May 15, 2018 10:52 am, edited 1 time in total. Oh sorry! I added it to my original post! @LittleTrain I've added your thread! I did so under "Canines - Dog-like" since the description of your species state they are dog-like, and they are not a hybrid of anything noticeable (since the fire they exhibit is more a trait than something they're combined with).